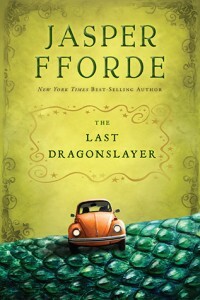 The Last Dragonslayer by Jasper Fforde. 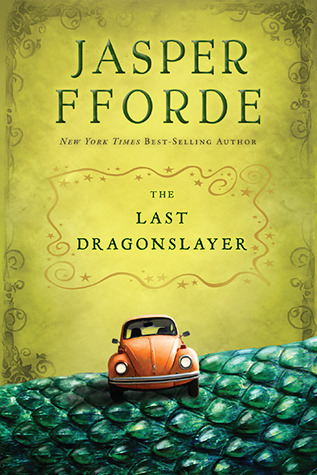 If you are a fan of cheeky British mysteries and/or metaliterature, you may be familiar with Jasper Fforde, whose Thursday Next novels and Nursery Crime series are quite well-known. His deft handling of the role of corporate culture, media, and government in a dryly ironic manner that only an Englishman could do keeps him always funny and always interesting. This theme carries over into his first foray into his first series aimed at young adults and he pulls off the transition seamlessly. Jennifer Strange is a foundling, brought up by the Sisterhood of the Lobster and given to the Great Zambini (can you guess his profession?) to be trained as an apprentice manager of magicians. But when Zambini disappears and she is left, at age fifteen, to manage a building full of magicians (who are notoriously scatterbrained and disorganized) she thinks her new fate has been drawn. Little does she know that real fate is still awaiting: Jennifer Strange is the last in a long line of Dragonslayers, sworn to protect humans from dragons and dragons from humans. When it is foreseen that she will kill the last dragon, she embarks in her spike studded Rolls Royce Slayermobile to figure out what is fate, what is choice, and what is the matter with people. I usually avoid books involving dragons, but here I have made an exception and I’m glad I have. Although the whole series is out in the UK, we stateside folks have to wait for the next two books sometime next year.